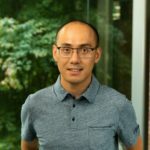 Short Bio: I started at Microsoft as an intern in 2005 and have been working in Visual Studio ever since. I’m currently a PM on the VS Shell Team. No, not the “Isolated” or “Integrated” Shell, but the core VS IDE – it’s UI and services. Prior to my current duties, I was the SKU manager for the Visual Studio Express products. Outside of work, I’m an avid football fan, love winter sports, and always enjoy some quality mac and cheese. Now, you may be asking, “Well the least you could do is give me some exception message that would make debugging this easier, right?” Unfortunately, no. Because of the managed to native interop on the initialization thread, all the code gets back is an HRESULT; it loses its error context. There are a few alternative approaches that we are investigating for RTM around providing a more meaningful error message. Now that I’ve given you the background, what do you do if you hit this? We’ll start with the most common case, at least for Visual Studio 2010 Beta 2. In Visual Studio 2010 Beta 2, there are two straightforward ways to get into this state. Both of these issues have been fixed for RTM, and, fortunately, there are workarounds for Beta 2. The first issue is importing a non-TrueType font from a previous version of Visual Studio. This was already covered by Brittany in her excellent blog post. The second way to get in this state is by a corrupted window profile – the file that persists your IDE window state. If you have floating tool windows (e.g., drag off Solution Explorer to another monitor or show the Find dialog), minimize Visual Studio, and then close Visual Studio from the minimized state, on the next launch you will hit this error. To workaround these issues, you’ll need to reset your settings file. NOTE: The IDE will be reset to its default state and all customizations will be lost. If you have customizations that you want to save, please copy CurrentSettings.vssettings under “%USERPROFILE%DocumentsVisual Studio 2010Settings” to another location. Type “devenv /resetuserdata”. The issue should now be fixed. If you wish to reimport your old settings, go to Tools->Import and Export Settings, select “Import selected environment settings and browse to the .vssettings file you saved. As mentioned above, both these issues have been fixed for RTM. Additionally, we’ve also added better fallback scenarios so that if something does go wrong, the IDE will try a few workarounds itself. Browse this MSDN article. This article is a bit outdated but does have some other causes and workarounds for fixing this issue. Some users have had success using procmon to see what Visual Studio is trying to load. This isn’t for the faint-hearted, but it might help you debug the issue. Analyze the Activity Log. Sara Ford has a post on how to do this. Your Activity log: From a Visual Studio Command Prompt, type “devenv /log”. Attach “%APPDATA%MicrosoftVisualStudio10.0ActivityLog.xml” to the bug. 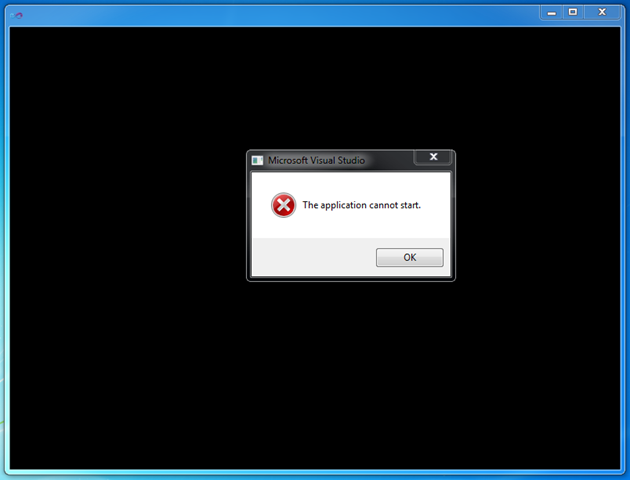 We have recently found out another possible cause leading to “Application cannot start” message for Visual Studio. This issue has been fixed by .NET Framework team for VS 2010 RTM, but if you’re still running the RC1 build you may still run into it. The problem occurs when the shell is trying to create a new profile file to store the VS settings. The shell calls System.IO.Path.GetRandomFileName() function to obtain a new file name where the profile settings will be stored. Unfortunately the function throws a “File not found” exception. According with a developer in CLR team, “The problem occurs when the code is running on a thread that has a user context without a loaded [Windows] user profile or with a temporary [Windows] user profile. In that case, Windows cannot access the key containers we try to ask for since those are stored in the user profile.”. For instance, one way that will cause Windows to start with a temporary user profile is to delete all the files and folders under %UserProfile% folder of a user from disk, then login on the machine with that user.